Featuring artists Chong Chu, Juan Alberto Negroni, Ellen Soffer and Thomas Zanz. FRESH a group show featuring stimulating work with vibrant visuals, playful compositions, and lyrical storytelling. FRESH displays the work of four mid-career artists who express their individual artistic language that comment on heritage, personal stories, or country of origin. Korean-American artist Chong Chu utilizes a lively painting style to express memories and faith. Korean and Western Folk Art along with postmodern cultural society inform his work. “Viewers can sense the storytelling aspects of Chu’s work that feels both modern and historical,” describes gallerist Mary Tomás. Chong Chu is a professor of art at Brookhaven College. His work is collected internationally. 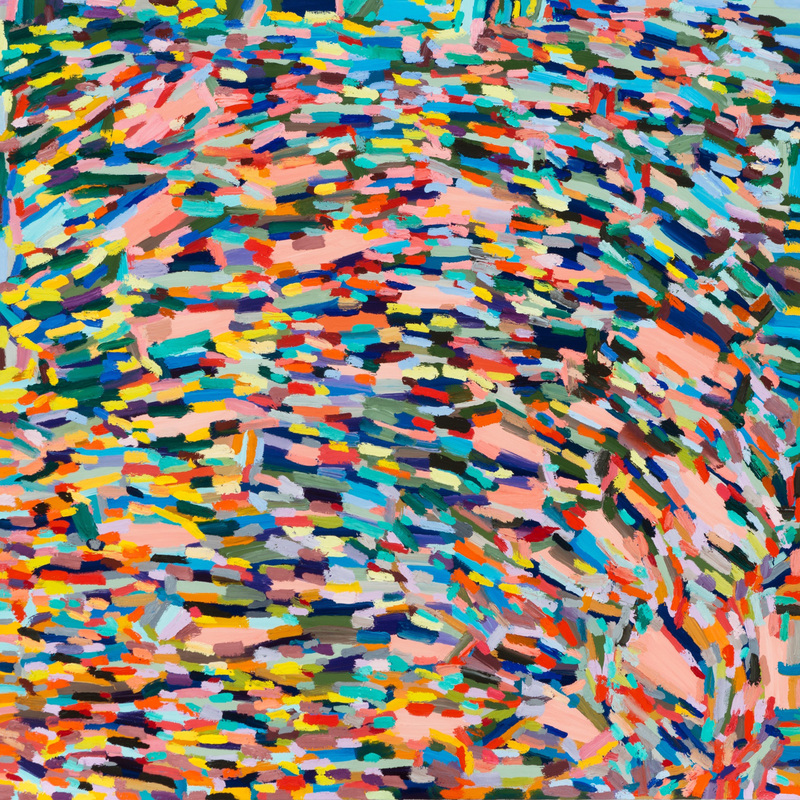 Puerto Rican artist Juan Alberto Negroni renders playfully exuberant compositions. Working primarily on paper with mixed-media collage, Negroni uses a variety of shapes, textures and colors to articulate his deep thoughts and feelings about his native origin, Puerto Rico and his multicultural experience living in Dallas. “Negroni is currently completing his second MFA degree in studio art at SMU and his work has been noted by our gallery patrons. The pieces are exciting and uniquely Latin in feel. Each collage invites you to come and play with him in the sandbox of ideas,” explains Tomás. Louisiana artist Ellen Soffer is fearless in her use of color. 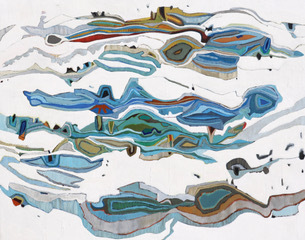 Large works in oil or acrylic on canvas or paper are vividly abstracted, ambiguous, and intuitively executed. Overlapping color combinations appear to dance within the space and strike a lively conversation between warm and cool tones. “As a painter myself, I find Ellen’s confident and masterful use of color challenging and thrilling,” exudes Tomás. Ellen Soffer obtained her MFA from the School of Art Institute of Chicago and actively pursues her fine art career with the same vigor evident in her painting style. Michigan-based artist Thomas Zanz believes that “the happiest place is right here right now.” Zanz has tirelessly explored color theory and its effects by forming a body of work that is uniquely his own. Each piece is constructed from scratch using handmade tools he has fashioned to create the colored surfaces and finished frame. Every work in the Happy Place Series comes with it’s own handmade box with a handle. Thomas Zanz wants you to take “Happiness with You” and every work comes complete with it’s own special message. Zanz work is found in collections across the globe. Exhibition through May 6, 2017. 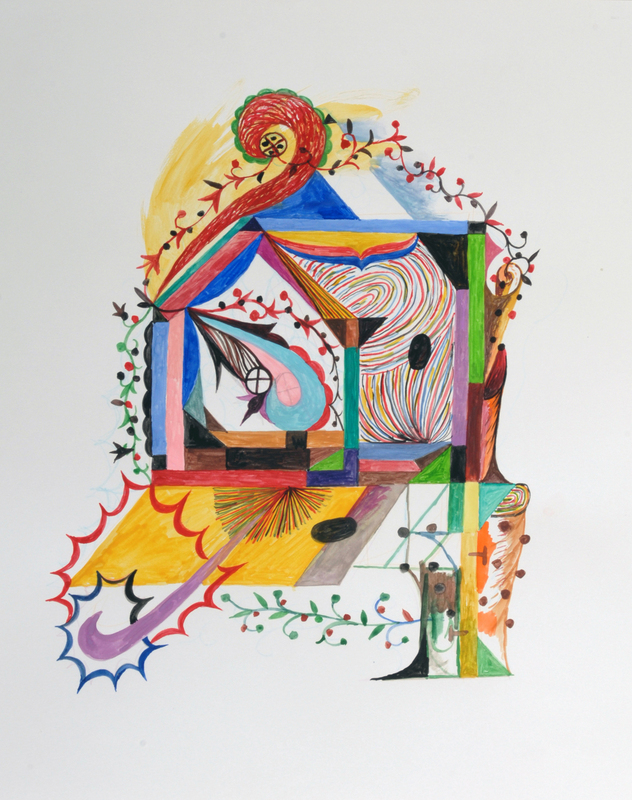 Chong Chu, Home 2, watercolor on paper, 17x14 in. 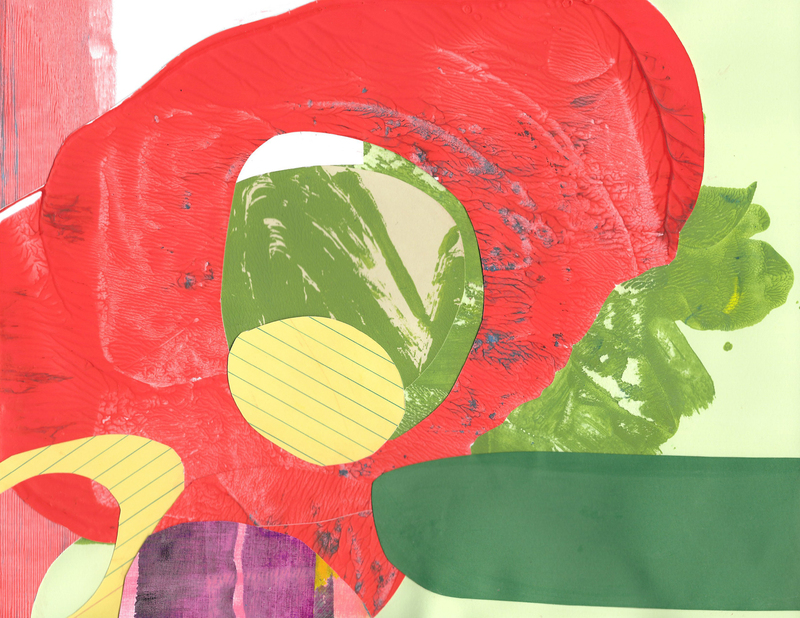 Juan Alberto Negroni, El Bosque de la J7, mixed media, collage on paper, 8.5x11 in. Ellen Soffer, Shimmer 78 - Reflection, oil on canvas, 30x30 in. 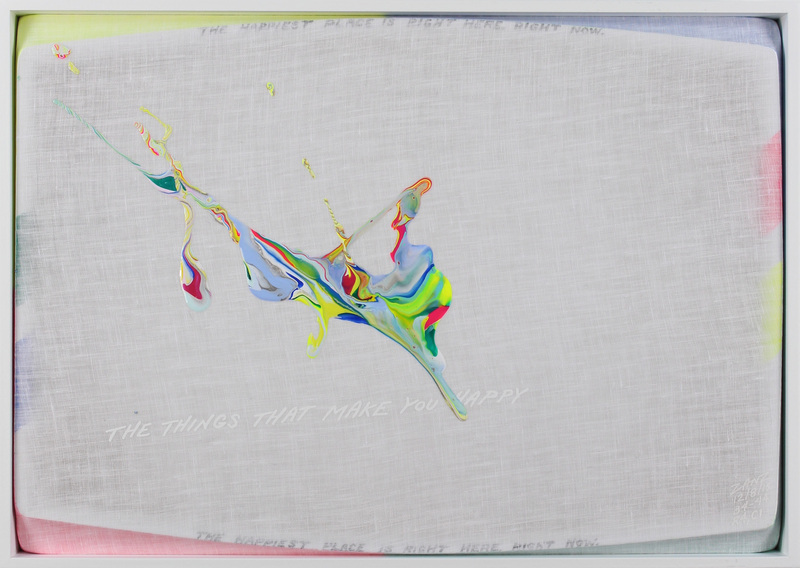 Thomas Zanz, Happy Things, acrylic on linen, 12.625x17.75x2.5 in.